GNU Press releases new edition of the Emacs manual! Don't miss our daily highlights on fsf.org! GNU Press now selling GNU/Linux Inside stickers! On January 11th, Aaron Swartz, a social justice advocate, free software author, and friend of the FSF, committed suicide. His loss has been deeply felt by many. Online self-publishing platforms have lowered barriers for authors to get their works published, giving rise to a new kind of literature that works without big publishers. Lulu is one of the most popular solutions for writers to easily sell their works in print or as ebooks. A few years ago, they defended their DRM-encumbered ebooks, but they have just announced that they are saying goodbye to DRM. The USPTO is organising roundtables to get suggestions from software developers. The FSF has requested to participate. 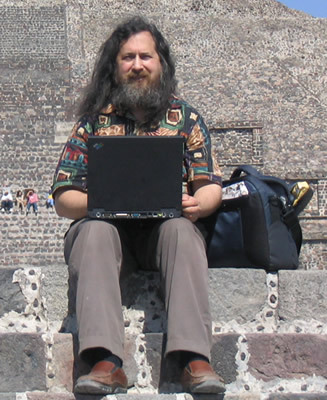 RMS and his laptops are inseparable, and they've been around the world together. In January we challenged our members to identify where RMS and his laptop are in this picture. The first to answer correctly received a free software tshirt. GNU Emacs manuals are back, now in the updated seventeenth edition for version 24.2, complete with a matching Emacs reference card. Enjoy learning to program (or write poetry!) with Emacs while sipping a hot coffee in our Emacs reference mugs. When you visit http://www.fsf.org now through the end of January (and maybe beyond! ), you'll notice something different about our home page. It's our new "daily highlight," a little tidbit of free software history, wisdom, art, and even goodies like shop.fsf.org coupons for you to enjoy. By popular demand, we are now selling the GNU/Linux Inside sticker pack. For $15, you receive 10 GNU/Linux stickers. Because these stickers are high-quality and durable, they won't fade away or scratch off your computer, making it the ideal way to rep your use of free software! We've launched an XMPP (Jabber) server for FSF members to use. If you're not already a member, join today and help us reach our "stretch" goal of 71 new members by January 31st. RMS was at the "II Fórum Mundial de Educação Profissional e Tenológica: Democratização, Emancipaçao e Sustentabilidade" in Florianopolis, to deliver his speech "Free Software and Your Freedom," on May 30th, and, on the 31st, to speak on the "The Free Software Movement: Appropriation, Designing and Use" panel, in front of about 500 students, professors, researchers, government workers, and union members. His message was simple: "For ethical education, the software used must be livre, and the teaching materials must be livre too." To help, join our weekly IRC meetings on Fridays from 2:00pm to 5pm EDT (19:00 to 22:00 UTC) . Meetings take place in the #fsf channel on irc.gnu.org, and usually include a handful of regulars as well as newcomers. Everyone's welcome. For this month, we are highlighting Promote Free Software, which provides information about working together to raise the profile of free software. You are invited to adopt, spread and improve this important resource. February 04, 2013, 07:00 PM, Dublin, Ireland, The free software movement"
February 2nd-3rd, 2013, Brussels, Belgium, FOSDEM 2013. FSF executive director John Sullivan speaks on February 3rd at 10am. You can unsubscribe to this mailing-list by visiting the link https://crm.fsf.org/index.php?q=civicrm/mailing/unsubscribe&reset=1&jid=127151&qid=3441579&h=046d8beec64c1ded.